Advent | Confessions of a Recovering P.K. If you follow the church calendar at all, you know that this past Sunday was the first Sunday of Advent. I had the privilege of kicking off our Advent sermon series called “He is greater than I.” Appropriately, the sermon was focused on Mary and her response to the news that she had received from the angel regarding her pregnancy. As I weaved my way through Mary’s song in Luke 1, I couldn’t help but think about what kind of a disruption this might have been for Mary. Mind you, the place of women in the 1st century near East is not near where the place of women is in today’s society, but you still have to wonder what kinds of things Mary hoped and dreamed of for her future. Regardless of those hopes and dreams, things turned out very different for the teenage girl. She had a lot of explaining to do and she probably had to put up with a whole lot of stares as she walked through town. Any chance of having been a wallflower was most likely lost as the world would eventually know her name and what she had done. I wonder if Mary realized the full extent of what she was being called to do. Of course, that’s been speculated in the song “Mary, Did You Know?” The angel who appeared to her was pretty clear about what she was being asked to do and who Jesus was, so it’s hard to think she didn’t know. But then, what else she heard after “You will become pregnant….” might be somewhat questionable, considering. Whatever Mary’s hopes and dreams may have been, they really paled in comparison to what she got. On a list of hopes and dreams, I’m not sure that anyone would consider “Mother of the Son of God” as one of the bullets, yet that’s just what she would become. Although I gave an immediate answer, it’s something that I’ve pondered a lot since the asking. While immediate answers aren’t always wrong, I find myself continually asking myself questions long after answers to them have been given. I had to think whether or not I had hopes and dreams for myself. If I did, what were they? As I thought about it, it seems that my hopes and dreams as I have gotten older have grown broader than they used to be. While there are some specifics, I find myself looking at things more generally than I did before, when I was younger. My hopes and dreams center around my family, hoping for certain things for my children yet not living vicariously through them. I want certain things for my children and my family. I want to experience certain things for myself. I want to be effective in what I do and even have some vocational hopes and dreams as well. But what happens if those dreams are never realized? What if they don’t align with God’s plan for me? I think that I learned about disappointment before I even left middle school. So, suffice it to say that the fact that my hopes and dreams might be dashed hasn’t stopped me from still hoping those hopes and dreaming those dreams. If I’m honest, I think that I might even find that like Mary, my hopes and dreams actually paled in comparison to what reality became for me. That’s not to say that I haven’t faced my share of disappointments, struggles, and heartaches, but overall, my blessings have exceeded some of what I dreamed they might be. As I have grown in my faith, I have realized that we can often get too specific in our asks from God. Don’t mishear me here, we need to ask God specifically for things, but I think we have a tendency to take it a little too far. I was the kid who had Jeremiah 29:11 as his senior yearbook quote, so I’ve had to grow into this myself. I think we get too hung up in whether God wants us to be an artist or an engineer, whether he wants us to have 2 kids or 4, whether we should rent a house or buy a house. I’m not saying that he doesn’t care, I’m just saying that when we ask those kinds of questions, we kind of miss the forest for the trees. God’s got a much bigger plan and we are only a small part of it. When we get so focused on specifics, I think that we’re trying to make ourselves a much bigger part of the plan than we should be. We’re not insignificant, neither are our desires, but there are much more important fish to fry than some of the ones that I have spent my time frying in the past. I probably dreamed of the wife and family that I would have, maybe obsessing a little too much on them before I had them, but now that I have them, I see that my dreams were tiny in comparison to what I actually got. I pursued one vocation for a decade until I stumbled into another one that I’ve been in for more than that. While I dreamed of what my career would be, I don’t think that I ever dreamed of what it has become. It almost seems as if my dreams have always fallen short of reality, although it might not have always looked that way to me. I’m not going to sit here and mimic a certain Houston pastor who wants you to live your best life now. I won’t sit here and say that God will always let you have what’s best for you (although that may be true). What I will say is that God will always let us have what’s best for him, what will bring him the most glory. In mulling that over, we can’t forget that one of the things that brought him glory was also the thing that brought him pain, the sacrifice of his son, Jesus. If God’s glory is even costly for him, why should we think that it won’t be costly for us? I think that what happens as we grow in our faith, our maturity, and our relationship with Christ is that our hopes and dreams align more with his plans for us. That’s doesn’t mean that we’re always aligned, but I think that we begin to want what he wants, making our hopes and dreams his will. Does that make sense? I’m still hoping and dreaming, and I plan to until my dying day. The minute that I stop hoping and dreaming is the minute that I begin to give up, and that’s not something that I want to do. I’m going to keep mulling this over, but for now, I’m going to go hope and dream some more! I’ve been going through a particularly stressful situation lately and I’ve felt my blood pressure rising with my anxiety. In the midst of it all, I’ve been intentional about carving out time to seek the wisdom of God and to meditate and pray. The other day, while I was driving, I remembered a verse that had struck me which I had memorized while our church was going through a study of the book of 1st John in the Bible. The verse is 1 John 4:18, “There is no fear in love. But perfect love drives out fear, because fear has to do with punishment. The one who fears is not made perfect in love.” It was as if that verse had just been implanted in my brain and I couldn’t stop thinking about it. Within just a few short hours, I encountered two additional references to that very same verse, one in a phone conversation with a friend and church member whose small group had discussed the verse during their study the night before, the other from a friend on social media who mentioned that Bono, the lead singer for the band U2, had quoted it during the band’s concert in Paris the night before. As I went throughout the day, continuing rolling the words of the verse over in my head, I made it part of my prayer and I eventually encountered it again as my brother-in-law shared it on social media as well. Now, I have a tendency to be stubborn and sometimes thick headed, but not so much so that I would miss a message that was being given to me over and over again, especially all within the same day. I felt like there was a reason why that verse had come to my mind and that was just confirmed when it was mentioned no less than three more times as I went through the day. When we come to decisions, situations, or crises in our lives, we have a choice in our decision making. We can either choose to be led by faith or led by fear. That was the truth that seemed to strike me between the eyes as I pondered and meditated on that verse the other day. As I thought more about it, I thought that the leap from faith to fear doesn’t seem to be so large. Somehow, it seems so much easier for me to make that leap, almost effortless. On the other hand, the leap from fear to faith can sometimes feel like a leap from the earth to the moon, it feels like it’s the longest distance that I’ve ever traversed in my life. That’s a phrase that we see in the Bible repeated numerous times, and I think it applies here. We often may find ourselves leaping from faith to fear and needing to find our way back to faith again, but God reminds us that he is love, he is not fear. While there is a way for us to think about God in a fearful way, that is more of a reverential approach rather than a trembling and cowering approach, especially when we’re being obedient to him. There is no fear in love because perfect love casts our fear. People use fear to punish, to control, to manipulate, and to push. 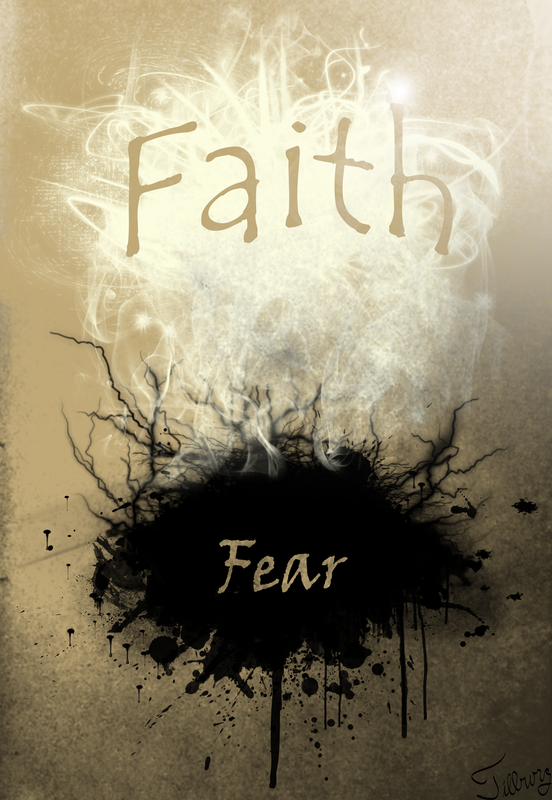 Fear has nothing to do with God and those of us who use fear as a means for getting our way as well as those of us who embrace fear as a way of life need to find ways to make that leap back to faith. Over and over again, as I’ve been ruminating on this verse, I’ve realized how easily I can fall into the fear-filled trap rather than living in the faith-filled moments. God calls us to live lives full of faith, it’s the essence of who we are as we follow Christ. We are not called to be led by fear. In the midst of a world that has a lot of scary things, it doesn’t mean that we don’t concern ourselves with those things, it just means that we still trust that our faith isn’t in those things and the people behind those things, our faith is in the One who is the very definition of love, perfect love. We do not fear because HE is with us. We pray, we fight, we move, we stumble, but our faith is not based on any of the things that WE control. As we journey through a fear-filled world, may we find hope, peace, joy, and perfect love for the journey. It’s pretty easy to get caught up in the rush of the Christmas season every year, being whisked away amidst the Black Friday deals, Santa Claus lines at the mall, and all the things that have a tendency to pull at your wallet and vie for your attention starting the day after Halloween (or earlier in some places and stores). If you’re one who believes in Jesus and considers the Christmas season to be reason to celebrate his birth, it’s always good to have a means to stay focused on “The Reason for the Season” as the busyness and distractions ensue around you. Enter John Greco. John has put together a thoughtful, informative, and well-researched collection of “meditations on Christmas and the gospel of hope” called “Manger King.” Through these meditations, Greco focuses the reader on the story of Christmas reaching back far into the Old Testament, past the birth of Christ, and to his expectant return one day. He relies heavily on Scripture and personal stories to assist in this feat. Greco is self-admittedly a fan of Andrew Peterson and his song cycle “Behold the Lamb of God.” For anyone unfamiliar with Peterson or his song cycle, he masterfully tells the story of Jesus starting back with Moses, painting the picture of “the true tall tale of the coming of Christ” as he weaves through the story of Israel, including the Passover, the deliverance from Egypt, the birth of Christ, and the sacrifice that Christ made as the lamb of God. In much the same way that Peterson tells the story through music, Greco tells the story through words. He uses his gift of storytelling and prose to fill in the back story of Christmas, exposing some common assumptions by reflecting on what the Gospels say and taking into consideration some of the contextual elements of the story that might easily be glossed over by the casual reader of the Gospel accounts. As he writes, “We’re missing out if we gloss over certain points or ignore how God himself tells the story. No matter how comfortable and familiar our nativity scenes may be, we’re only cheating ourselves if we hold on to tradition at the cost of truth.” He urges the reader to cast aside the comfortable and familiar for the more appropriately correct interpretations of what the Gospels say. The chapters and reflections in “Manger King” are short enough to be able to take a journey through them on a daily basis as you venture into Advent every year. While they connect with each other, they could easily act as standalones which step through Advent in a methodical journey, helping to focus the reader on Jesus Christ and the bigger God story that Christmas means to us. While I didn’t find much new information in “Manger King,” I’m not sure that could be said of those without a theology background or seminary degree. Greco’s thoughtful engagement with the material and his treatment of it is thorough enough to be worthwhile for the academic reader but not so academic that it would leave the average “Joe” or “Jane” in the dust. He is passionate about this material and that passion shows up in how carefully and thoroughly he treats it. Greco adds an appendix in which he more exhaustively treats the Gospel accounts in Matthew and Luke of Jesus’ birth. Within the appendix, he dispels notions of an inn in the modern sense of the word, shepherds and wise men together at the manger, and even the public shunning of Mary at her unwed pregnancy. It’s a helpful reference for those who want to dig deeper into the Christmas story without having to do all of the research on their own. 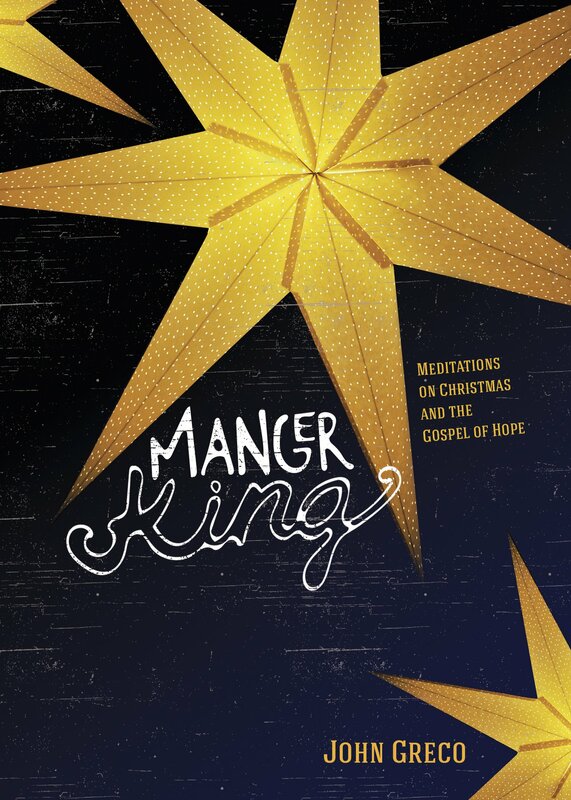 Christmas books will come and go, riding the latest trends and promoting the most popular themes, but “Manger King” is a book that focuses us on what’s most important about Advent and Christmas. It’s worth a read, whether you’re a novice at this Advent thing or you’ve delved into the material before. Pick up a copy to help you reflect on just how essential Christ is to Christmas and what a gift the world received when he came. Some of you are scratching your heads and wondering, “Who’s is Andrew Peterson?” When I first heard his name and listened to his music, I was not impressed. That’s not so unusual for me, it takes me a while to latch onto things that are unfamiliar. A friend told me about Dave Matthews a few years before he hit the big time and I just didn’t get it. Same thing with Jars of Clay. Now I’m a big fan of both of them. Back to Andrew Peterson, though. I’m always trying to find new and different Christmas music. 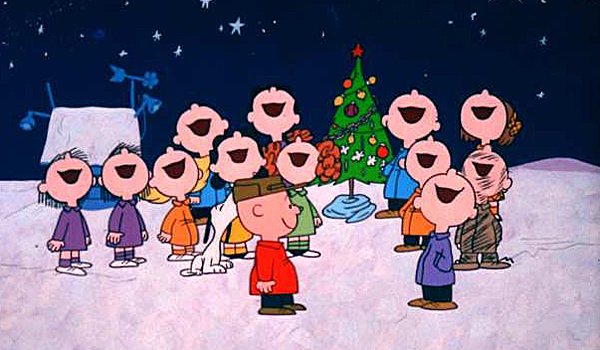 While many people are fine with the usual Christmas music fare of Bing Crosby, Nat King Cole, or Dean Martin, I’m always trying to reimagine the Christmas season in the musical realm. I mean, how many ways can you hear some of these songs done, redone, and then done again? Just a search in my music library and I find that I have 26 different version of “Angels We Have Heard on High.” Seriously? A few years back, a friend and I were driving in his car and he put a CD on while we talked and it was enough to distract me from my conversation with him. I kept getting drawn to the music. He sang along as well, completely out of tune and off key, but I started paying attention to the words. Curious as I was, the natural question for me to ask him was, “Who is this?” When he told me that it was Andrew Peterson, I was both surprised and intrigued. Yes, I had heard the name before but I didn’t remember hearing him like this. As I began to pepper my friend with questions, he told me what he knew about the album, “Behold the Lamb of God.” It was a song cycle, which always excites me as a musician and hack songwriter. Weaving and forming a group of songs together with a common theme is not an easy thing to do and be successful, it’s a challenge. Artists have done it (or attempted to do it) for years, artists all across the map. 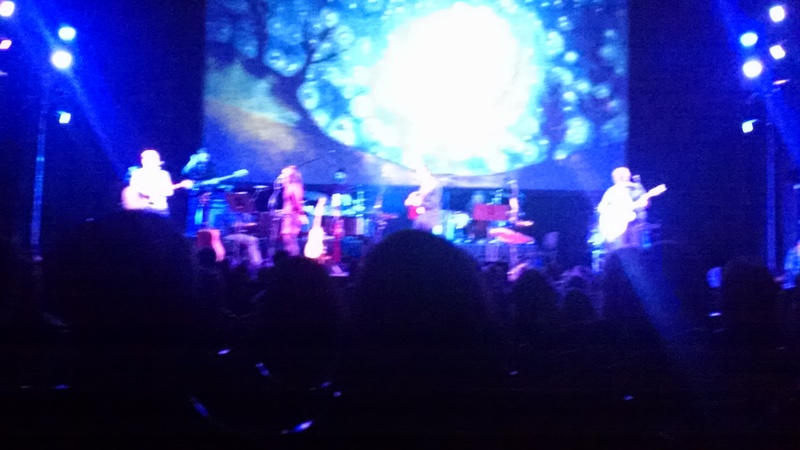 But a song cycle about the Gospel message, that was even more intriguing to me. I purchased the album and began listening to it……and I just couldn’t get enough. This was all before I went to seminary as well. Now that I have seminary under my belt and now that I’ve grown even more in my faith over the past few years, the story and its power as well as the way that Peterson tells that story are powerful. With wit, wisdom, eloquence, and craftiness Peterson tells the story of the Messiah starting way back with Moses. While all of the songs are good standalone songs, when you put them together, the sum of the parts is equal to something magnificent on many levels. Once I was hooked, I shared the music with everyone that I knew. 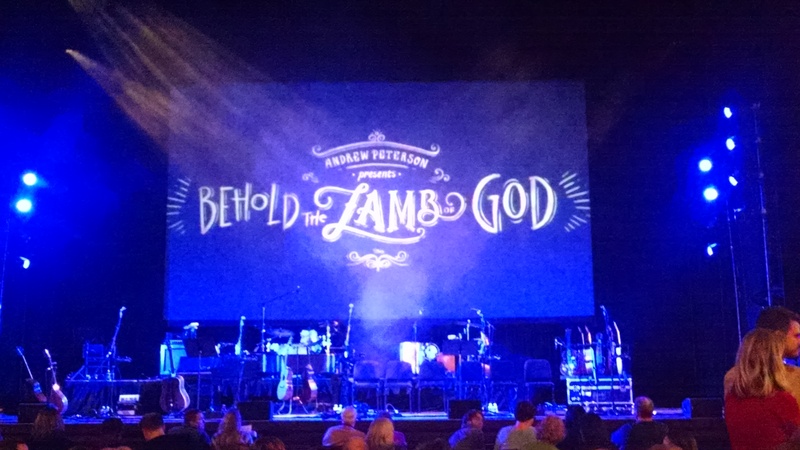 As I followed Peterson more and more, I found out that he toured the country performing “Behold the Lamb of God” with his friends during the month of December ending up with a few shows before Christmas at the famous Ryman Auditorium in Nashville, Tennessee. I immediately began to search where this tour would be going to see if there was any chance that I might be able to catch it. Sure enough, on Friday, December 3, 2010, Peterson was scheduled to be in Richmond, Virginia. I found out when the tickets were going on sale and told everyone that I knew and bought a bundle for myself. My parents had just moved to Williamsburg a few weeks prior to the concert and I thought that they might enjoy the concert as well. They didn’t seem to keen on the idea, so I enlisted them as babysitters. Turns out that it would be the last Christmas that I would have with my mom. For 4 of the last 5 Decembers, Andrew Peterson has been coming back to Richmond. I’ve been there every time. In fact, it almost seems like the perfect way for me to usher in the Christmas season. I look forward to it every year and look forward to the day that I can go to Nashville to experience it in an historic venue like the Ryman. Last night was the night to share in this experience once again, and it did not disappoint. I felt just like a kid on Christmas Eve, even more so when I found out that Thad Cockrell was on the tour as well as Caleb Chapman (trying to make it on his own outside of the shadow of his dad, Steven Curtis Chapman). Peterson has the same format on the tour every year. Since there are other artists traveling with him, he shares the stage with them for the first half of the concert, going through the cycle of them twice to allow for everyone to get a feel for who these artists are individually. As the musicians played, I continued to anticipate the second half of the concert where Peterson and friends play the entire song cycle of “Behold the Lamb of God” from beginning to end with no stops (except for applause). For the hundreds, if not thousands, of times that I have listened to the song cycle, I always find myself sitting enthralled as I find myself in these repeat listenings. In fact, as each song waves into the next one, I find myself feeling a bit of regret and sadness over the fact that the songs will end as will the concert. But there are moments to simply savor and soak in all that surrounds me in the aural realm. There are moments that I simply want to pause and hibernate in for the winter, such sonic goodness that I want to capture and bottle up. But alas, the night does end and the feeling passes, but what is left behind is the impetus for me of what will become the Advent season. It spurs me into the season in a way that no Black Friday sale or Bass Pro Shop Santa Claus ever could. It sets the trajectory of the season in the right direction, not assuring perfection, but helping me come pretty darn close to it. Peterson doesn’t have any hits, as he even jokes about in his own self-deprecating way, at least not in the formal sense, but to me, this whole album is a hit. It’s a hidden treasure that’s just waiting to be found out, dug up, discovered. I’m glad to have discovered it and look forward to kicking off my Christmas season each year with it. I guess I’ll savor that for as long as I possibly can! This past Sunday was the first Sunday of Advent. That might not really mean much to some of you, so let me explain…….no, no, it’s too much, let me sum up. Advent means “arrival” and the season is all about preparation and waiting for the celebration of the birth of Jesus. We enter into a season where we can focus our hearts on what we are truly celebrating. In today’s culture, it’s harder and harder to find that space to do this. Everything bleeds into our lives and begins to take over, much in the way that Black Friday has bled into Thanksgiving Thursday. Everything is vying for our time and attention, screaming to us that whatever it is is the most important thing and demands us to focus only on it. I always remember Jesus’ words about the need to become like a child in order to enter the Kingdom of Heaven. We can overcomplicate our lives and shift our focus to unimportant things, but it’s always a good reminder during this season for me to watch my children. What makes them excited? What do they talk about? What kind of imagination and wonder are they experiencing as they sometimes experience for the first time the things that I have taken for granted? Hope. Joy. Love. Peace. These are the staples of the season. Happiness is purposefully missing there, and it’s the very thing that drives so many of us. We just want to be happy, to be content and have everything that we want. But hope, joy, love, and peace don’t come to us through our own conjuring. We don’t work harder and find that those things magically appear in our lives like a reward at the end of a video game level. In finding them, we need to lose ourselves. I work on getting prepared for Advent way before Thanksgiving weekend. 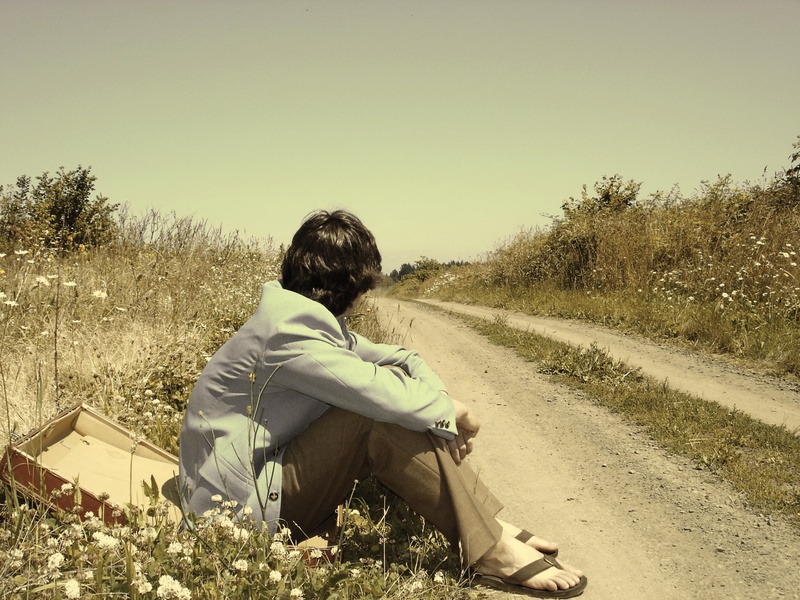 I know myself and the need to slow down, to take inventory, to assess where I am and where I’m going. If I don’t intentionally slow down and even stop, December 25th will be behind me and I will be shaking my head in astonishment that I missed the moment. So, I come upon another year, another opportunity, to wait and watch, to capture the wonder of what I am celebrating this year. So much has changed over the past few years, but these things should not be the ones where I find my hope, my joy, or my peace. Love, yes, but the other three are not things which can be provided for me by stuff, possessions, or even people. Already a few days in and I can feel myself grabbing for the paper bag to breathe into as I begin to hyperventilate over all the things that need to get done. I need to slow down, make my list, check it twice if I must, and then move along at a pace that is less than harried, less than focused. I’m waiting and watching, looking for hope, joy, and peace. Where do I find it? I find it not so much in the manger but in the One who I find in that manger, God incarnate, come to enter into life with us. As soon as the calendar turned from Halloween to the first day of November, social media started lighting up with people’s complaints about hearing Christmas music in all the stores, on the radio, and everywhere else that they went. It kind of made me smile considering that I start listening to Christmas music sometime in July or August. I do that for two reasons. First of all, I need to start thinking about Christmas and Advent in July or August in order to be prepared in advance for everything. Part of my job is to make sure that the theme for our church to focus on during the Advent season is chosen early enough to allow for musical selections, drama selections, and any other creative ideas that might emerge as I meet with my Creative Team. I need to be prepared. The second reason for starting to listen to Christmas music that early is just because there is too much good Christmas music (IMHO) to relegate it to the four weeks of Advent. There is just no way that I can listen to all of the Christmas music that I want to listen to in that period of time. In fact, if I were to start listening to music for 24 hours a day starting from the first Sunday in Advent until the end of Christmas day, I’m still not sure that I would be able to get through it all. I know that some people are lamenting the commercialization of Christmas, and that’s probably their biggest complaint. I get that. I’ve added to the problem by going out on Black Friday (which has slowly started to creep into Thanksgiving day). I am not innocent, and I can be the first one to confess that. But is there a silver lining behind this cloud? Is there something that we might be missing? As a pastor, one thing that often frustrates me is our lack of preparation for corporate worship times, both the preparation of myself as well as the congregation. We often show up to our corporate time together without having sufficiently thought about what it is that we are going to be doing together. We need a call to worship, a means to engage us, to get our minds and hearts in the right place. Depending on who you talk to will determine whose responsibility that call to worship is. I think it’s a joint effort, the individual as well as those who are actually leading. With the hustle and bustle of the Fall, it’s too easy to get lost. I looked at my calendar the other day only to realize that November is here and Advent will be upon us in a matter of weeks. I can’t slow down the calendar. I can’t stop the world (and melt with you?) to prepare myself for things, I need to prepare on the fly, multitask and get it done. I wonder if we might take the early descent into Christmas music and look at it more as an ascent into the expectancy of the Advent season. Sure, not every song that we hear is Silent Night or Joy to the World, but can the thought of Christmas and all that it means for those who put their trust and faith in Christ be enough to act as a call to worship of sorts? Can we take those songs and use them for good to start us into thinking about the greatest gift that we received? I’m going to try it this year. Of course, it might not be as hard for me because of what I do, but every time that I hear a Christmas song, I am going to do my best to remember why we celebrate Christmas to begin with. I’m hoping that it might help and act as a Christmas call to worship. It’s Christmas Eve, and this year, it looks different for me. This is the first Christmas Eve that I won’t be thinking about school assignments or upcoming classes. A year ago this month, I completed my coursework in seminary. In the months following, I still had one other requirement that was delayed and which hung over my head. This is the first year that my head is clear of schoolwork. This is the first Christmas Eve that I will celebrate without my parents. Last year, Dad was still around, albeit in bad shape, but he was still here. A few days after Christmas, my cousin was married and my dad was able to be there. Little did I know that in less than four months, Dad would be gone. This is the first Christmas Eve that I will be celebrating with my new church family. Well, they’re really not new to me, but our situation is still less than a year old. We have only been in existence since February under our new name. This is the first Christmas Eve that I will celebrate in a school. Our church has only been in existence since February and we do not have a building, so we have been meeting in a school. This Christmas Eve will give us opportunities to try new things, do things differently. This is the first Christmas that I will be around when my children go to bed. In 2004, I left my engineering job to become a pastor. Since then, Christmas Eve has been devoted to the church and I have not had the opportunity to spend much time with my family. Our services this year are earlier, so I will have the opportunity to be at home with my children before they go to bed, something that will be very exciting for them and for me. Every year, as I move into the Advent season, I do my best to slow down, to take it all in, to establish traditions with my kids that were my own or that are being created for the first time with us as a family. Every year, I have found myself clamoring for rest, for a breath of air amidst the frantic hustling to make sure that everything is perfect and taken care of for Christmas. This is the first year that I actually feel that it has happened. I haven’t perfected it, far from it in fact, but I feel like I am a step closer to improving my overall demeanor and approach towards the Advent season. All I know is that my stress has been a little bit diminished and my outlook has improved. This is a season of expectation and wonder, and I am beginning to recapture that expectation and wonder that was lost a long time ago. Merry Christmas Eve.